Paths plot a course in landscapes and gardens. As designers, we utilize paths to create a narrative experience. Every landscape or garden or has its own history, ecology, and topography. We use these site specific traits, in combination with form, enclosure and materials, to create designed-experiences as one moves along a path and through a garden or landscape. With thoughtful consideration of the landscape, topography, users, and program we create experiences that provide a sense of wonder, variety, and mystery. Paths vary by shape, materials, layers and organization; they are steeped in landscape symbolism and vernacular; and they provide a means of finding your way. A path can be as simple as a narrow dirt trail through the woods to create a sense of solitude, enclosure, and wildness, or an elegant mown path through a field with an open horizon and sense of freedom. 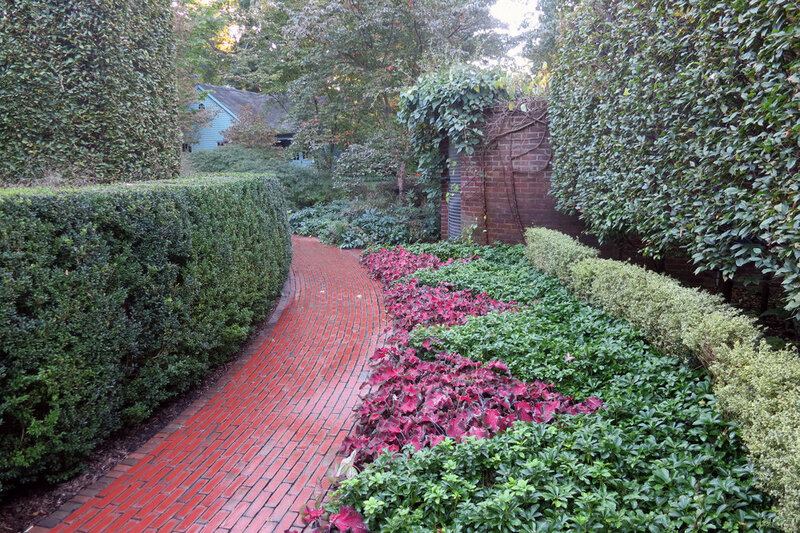 A simple garden path may have complex layers of meaning, curated through carefully crafted form and materials. Paths can be organized by hierarchy, along an axis or meander, and by series of waypoints and destinations. Materials tell stories, create a variety of sounds, and add texture and patterns. For example, crushed rock creates an audible “crunch crunch” sound as you walk, whereas stone has a silent natural and timeless character. Classic brick patterns can be also be used draw the eye and add texture. There are an endless variety of path-materials; each tells a different story and offers a different experience. Landforms, vegetation and plant structure can all be used to create different levels of enclosure. Shrubs and trees may be planted close to the path limiting site lines. Earth forms may be used to screen and direct views. Scattered trees and groundcover may be used to create a sense of openness in the understory while simultaneously providing an enclosed canopy. The pace and tempo of a path varies by material and shape. For example, stepping stones can gently lead you through the woods as a minimal indicator of a path. They set the tempo and pace along a path as it curves among hedges. A path does not always need to maintain the same width. Variations in the width of the path can influence how you move through a space, creating visual moments of compression at narrower points and release as the path broadens.